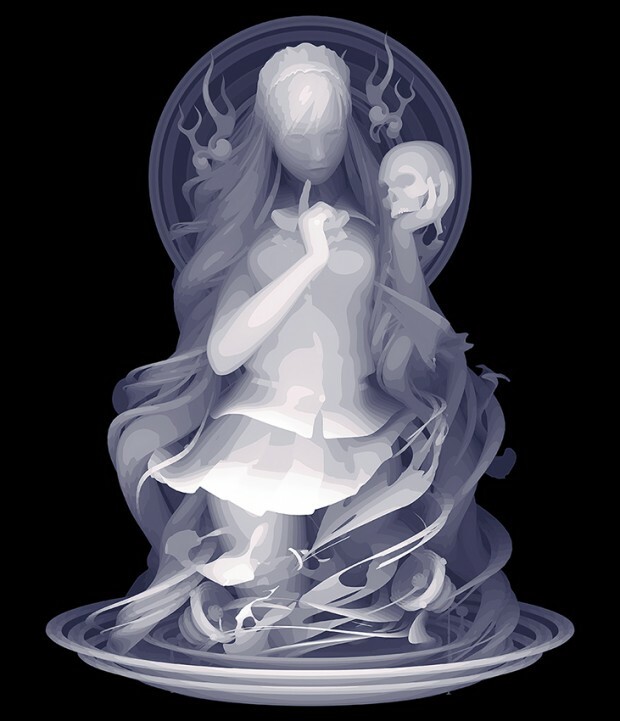 Kazuki Takamatsu is the young Japanese artist who brings in Italy his technique of the depth-mapping (a fusion of classic design, airbrush and gouache painting with computer graphics) with a show at the Dorothy Circus Gallery, in Rome. From February 14 to April 4, 2015 the gallery in via dei Pettinari 76, in the center between Campo de ‘Fiori and Via Giulia repeats for the second time in its spaces the Takamatsu artwork’s in a solo show “Even a Doll Can Do It” with a new series of 15 paintings. In the paintings appear bodies of women, half dolls, suspended three-dimensional abyss that comes to life by meticulous shades of black and white distinctive artist, already presented in 2013. We will see then young schoolgirls illuminated X-ray that clutching guns, head dress of celestial aura, in an artistic imagination that draws inspiration from popular culture and its ancient roots. Through the use of the many levels of transparency created by the mixed acrylic gouache technique, the artist creates works characterized by the dominant presence of an effect “Hologram”, executed entirely by hand “able to completely wrap the viewer in the energy of a metaphorical dance emphasized contrasts “. which summarizes symbolically the good and evil and “the margin where there is neither light nor shadow”, combined with a meticulous painting technique: his figures, emerged from the water, seem move in an intimate space constantly dominated by the sense of hope and rebirth of awareness of pain. and for them will sign copies of the first monograph devoted to his art, curated by Dorothy Circus Gallery and published by the Drago Publishing house. During the opening on February 14, 7:30 pm. , The Dorothy Circus Gallery together with the Dragon Publishing will also present “The Doors of Perception”, the third volume in the series of annual Dorothy Circus Gallery Takamatsu who chose for the cover. Inside the volume, the exhibitions: “Daphne Descends” – Alessia Iannetti, “Fortune 13” – Paul Guido, “God is Her Deejay” – Sas & Colin Christian, Afarin Sajedi, Francesca R. Di Nunzio, “White Elegy” – Kwon Kyungyup, “Because I’m a Doll” – Kazuki Takamatsu, “Hide & Seek” – Natalie Shau, “Tear Aquarium” – group exhibition, and focus on Chris Berens, “The Silent Circus” – Clementine De Chabaneix, “The Trouble with Angels “- Ray Caesar. The thirty-six Takamatsu was born and resides in Japan, a country known for its picturesque scenery and the high suicide rate. A dualism, which contributes to permeate his works of wonderful sadness. He studied painting disciplines at the Department of Oil Painting at the Tohoku University of Art and Designs, graduating in 2001. He now lives and works in Sendai, which was destroyed in 2011 by the earthquake and tsunami in Tohoku. Since 2009 collaborates with the gallery Tomura Tokyo, with which he has taken part in the Tokyo Art Fair and Art Asia Miami during the Scope Art Fair. 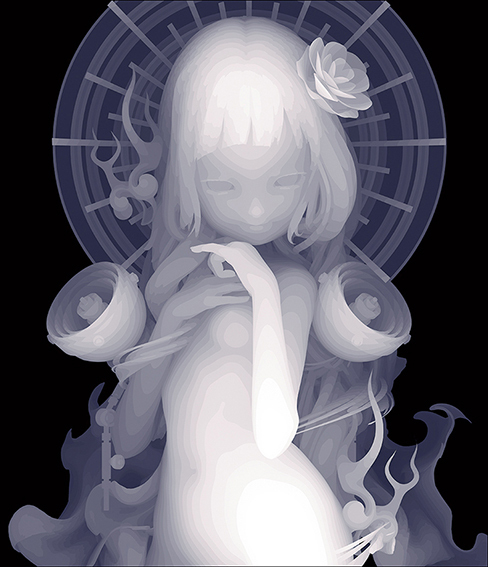 His works have also been exposed to the Rias Ark Museum in Kesennuma, Miyagi, and have had great success with the public and collectors in the US as RoqLaRue prestigious galleries in Seattle and Corey Helford in Los Angeles. With the Italian Dorothy Circus Gallery is the second solo exhibition (2013; 2015) and participated in “Tear Aquarium” (2013), institutional collective exhibition held at the Museum of the Roman – House of Architecture in Rome. In 2014 he won the cover of the popular American magazine Hi Fr. The creative process of Takamatsu begins with the Shadow / Depth Mapping, a kind of process projective shadowing with which the shadows are added to the 3D computer graphics used in both pre-rendered scenes, both in real time and in many console and PC games. Monochromatic objects, hand-painted, are obtained by mixing watercolors with an opaque white pigment through a conductor to water (gum arabic). This method is traditionally referred to as Gouache, name from the Italian word, literally “mud”. The Gouache is ideal for drawing and for photocopying. Since the paint Gouache confers most of the texture and these surfaces contribute to a coating film perfectly flat, the painted Gouache are typically made of paper printed or hot plates smooth. The perfect sense of depth given by the nuances of which are composed of the shadows, is obtained by a careful study of the pixels that are made visible by the light and the three-dimensionality of the images that appear to acquire a tangible form. In this way, each pixel on the object has a gradient that is proportional to its distance from the light source and the eye of the beholder, so as to appear real, like a hologram and evoke an amazing sense of depth. Tagged arte digitale, artista, depth, dorothy circus gallery, giapponese, grafica digitale, mapping, pittura gouache. Bookmark the permalink. Polda Brown liked this on Facebook.